Offering just about everything you need to sing the Liturgy of the Hours (in an adapted format), this resource will advance the prayer life of bilingual parishes and those attending conferences, diocesan gatherings, and other events. The first bilingual setting of morning, evening and night prayer! Introducing the first bilingual setting of morning, evening and night prayer! Offering just about everything you need to sing the Liturgy of the Hours (in an adapted format), this new resource will advance the prayer life of bilingual parishes and those attending conferences, diocesan gatherings, and other events. The collection includes introductory verses, hymns, psalmody, canticles, responsories, Gospel canticles, intercessions, and more. Extremely versatile, it allows for singing the office entirely in English, entirely in Spanish, or bilingually. You can even sing the verses in one language then echo or respond in the other. Designed especially to help diverse parish groups join together to sanctify the day, all three liturgies feature psalms and canticles from the first Sunday in the four-week cycle. Morning prayer contains settings of Psalm 63, the Canticle of Daniel and Psalm 149. Evening prayer includes Psalms 141 and 142 and the Canticle from Philippians. Night prayer (Sunday, after Evening Prayer II) has a setting of Psalm 91 and two Marian hymns. The songbook contains assembly editions and keyboard, guitar and vocal parts for all 20 songs. Some titles also have choral and solo instrument parts. Accompaniment and solo instruments vary from piano and guitar to flute, oboe, hand drum and cello. All antiphons have Spanish and English options; some, like the morning Gospel canticle (Benedictus), have a third option in Latin. The Orders of Service and Pedro's pastoral notes make it easy to get started. Featuring through-composed and chant settings, these new songs are accessible to the resources of any community. Produced by Cyprian Consiglio, OSB Cam, the CD makes a good learning tool as well as accompaniment for small group and individual reflection. Beautifully recorded, the disc features Pedro and talented singer Anna Betancourt on lead vocals throughout. In some ways, this resource is similar to Cyprian's Lord, Open My Lips. Arranged for flute, hand drum and guitar, the morning hymn, "Amanecer," is a gentle song with Native American overtones. "At the break of day, we sing to the Giver of light that wakes the morning. To you, O God, we dedicate our life, our thoughts, our works, our very being." The evening hymn, "Luz de Cristo/Light of Christ," invites Christ to dispel our darkness. In the verses, a cantor sings light-related titles for Christ ("Sun of Justice, Radiant Light") over a lovely ostinato in Latin. The collection closes with two bilingual Marian hymns or antiphons. "Salve Reina de los Cielos/Hail, Queen of Heaven" features simple piano accompaniment. "Queen of Heaven, Rejoice/Reina del Cielo, Alégrate" includes parts for hand drum, flute and guitar. "A source of piety, and nourishment for personal prayer"
As Sacrosanctum Concilium reminds us, "The divine office, because it is the public prayer of the Church, is a source of piety, and nourishment for personal prayer." All who sing the Liturgy of the Hours "are earnestly exhorted in the Lord to attune their minds to their voices when praying it." Mi Boca Proclamará Tu Alabanza is a wonderful selection of new music from Pedro Rubalcava. Thanks to this groundbreaking collection, Spanish and English speakers can sing, pray and find nourishment in the Liturgy of the Hours, together. Introducing the first bilingual setting of morning, evening and night prayer! Offering just about everything you need to sing the Liturgy of the Hours (in an adapted format), this new resource will advance the prayer life of bilingual parishes and those attending conferences, diocesan gatherings and other events. The collection includes introductory verses, hymns, psalmody, canticles, responsories, Gospel canticles, intercessions and more. Extremely versatile, it allows for singing the office entirely in English, entirely in Spanish or bilingually. You can even sing the verses in one language then echo or respond in the other. Designed especially to help diverse parish groups join together to sanctify the day, all three liturgies feature psalms and canticles from the first Sunday in the four-week cycle. The songbook contains assembly editions and keyboard, guitar and vocal parts for all 20 songs. Some titles also have choral and solo instrument parts such as flute, oboe, hand drum and cello. All antiphons have Spanish and English options; some, like the morning Gospel canticle (Benedictus), have a third option in Latin. Featuring through-composed and chant settings, these new songs are accessible to the resources of any community. Produced by Cyprian Consiglio, OSB Cam, the CD makes a good learning tool as well as accompaniment for small group and individual reflection. 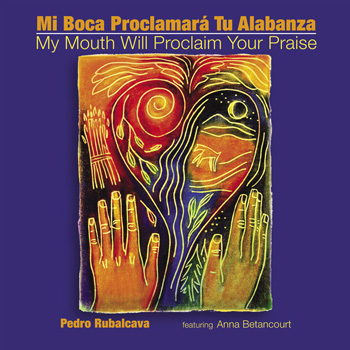 Mi Boca Proclamará Tu Alabanza is a wonderful selection of music from Pedro Rubalcava. Thanks to this groundbreaking collection, Spanish and English speakers can sing, pray and find nourishment in the Liturgy of the Hours, together.